What changes will make the 2020 Hyundai Kona different? Not much, as this appealingly odd-looking little crossover takes a breather after hitting the market for model-year 2018, then adding an impressive pure-electric version for 2019. Distinctive, solidly built, and efficiently packaged, Kona’s been well-received, scoring respectable sales and earning the automotive media’s prestigious 2019 North American Utility Vehicle of the Year award. A new color or two is possible, and we’d suggest Hyundai get a little more democratic with safety features by offering the least expensive trim level with blind-spot warning. Otherwise, expect the 2020 Kona to rerun the ‘19’s lineup: naturally aspirated and turbocharged four-cylinder models with a choice of front-wheel drive or all-wheel drive (AWD), and the front-drive, battery-powered Kona Electric with a maximum range of 258 miles between charges. For 2020, the subcompact-crossover class in which Kona competes will feature plug-in-hybrid versions of the Subaru Crosstrek and Mini Countryman. However, until Chevrolet and Nissan release crossovers based on their Bolt and Leaf, respectively, the Kona Electric will be the only purely battery-powered entry in the segment. The caveat is that, like the quasi-crossover Kia Soul and Niro EVs from Hyundai’s corporate partner, the Kona Electric is without an asset that defines a true crossover: AWD. Buy a 2019. The ’20 Kona won’t change enough to be worth waiting for, though it’s almost certain to carry a price increase. So you’d be asked to pay more for essentially unaltered SE and SEL models with a naturally aspirated four-cylinder engine and costlier Limited and Ultimate grades with a turbo four. Also back will be the 2020 Kona Electric in SE, Limited, and Ultimate trim. 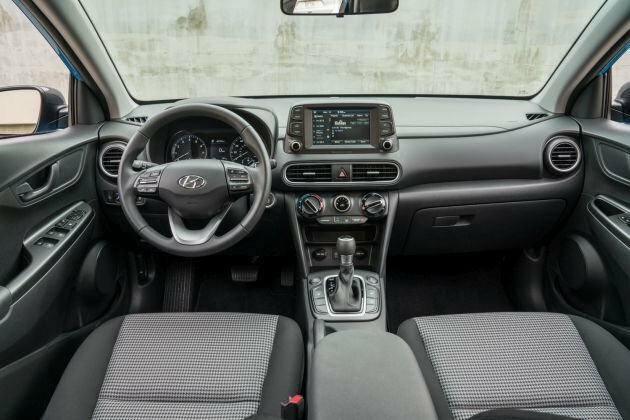 They’ll carry over 2019 upgrades highlighted by the inclusion of Hyundai SmartSense safety technology standard across the board, meaning every version of this five-seater now comes with autonomous emergency braking, lane-maintaining automatic steering correction, and drowsy-driver alert. Another useful driver assist, blind-spot and rear cross-traffic alert, was standard for 2019 on all but the gas-powered SE. Kona buyers on a budget could wait to see if this South Korean automaker makes that additional assist available on the entry-level SE for 2020. 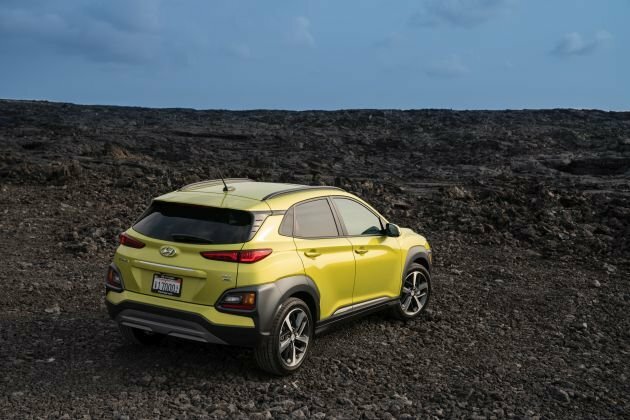 If those shoppers are going to wait, they and other Kona considerers may also have a chance to audition an even less expensive Hyundai crossover. Reports say the company is preparing to launch yet another new crossover sized and priced below the Kona. For 2019, Hyundai added Sunset Orange to exterior color choices already rife with look-at-me hues like Lime Twist and Pulse Red. And you’ll again be able to pair some colors with an optional contrasting roof: Surf Blue with a dark-gray top, anyone? Hyundai could continue to play with that palette for 2020 but isn’t apt to toy with Kona’s overall look until a midcycle freshening around model-year 2022. Until then, it’ll continue to seem as if stylists emptied their box of tricks to produce a crossover with an action-packed face, wavy body sides, and busy bustle. The lively exterior colors will remain offset by black cladding that exaggerates the swollen wheel arches, multicontoured front and rear fasciae, and trendy “floating” rear roof pillars. The Kona Electric shares the gas models’ overall look, but instead of a big hexagonal grille its front fascia is mostly closed-off. And, of course, it has no exhaust pipe or gas-filler door, its charge port behind a hinged panel in that closed-off fascia. Incidentally, the eyebrow-like lights on the upper front fenders of every Kona are LED daytime running lamps. The headlights are beneath, in the lower fascia (they’re LEDs on all but SE models). On gas Konas, visual distinctions between trim levels will again come down mostly to wheel size and design: 16-inch alloys for the SE, 17s for the SEL, 18s for Limited and Ultimate. All Kona Electric trims get their own aero-optimized 17-inch alloys with low-rolling resistance tires. Whether you regard the styling as cute or cringeworthy, there’ll likely be consensus about the efficiently packaged interior. The ’20 Kona will remain slightly below class average for overall length and height. But Hyundai carves out fine front-seat space, good headroom all around, and a rear bench that puts passengers in a chair-seating posture to maximize legroom. Credit engineers with integrating the Electric’s battery pack to give cabin and cargo volume equal to that of the gas model. Still, at 19.2 cubic feet behind the rear seatback and 45.8 with it folded, luggage space is no better than par for the segment. You’ll appreciate the plethora of small-items storage space within the passenger compartment, as well as the orderly and attractive dashboard and the precision feel to the well-marked controls. Indeed, Kona’s interior materials are uniformly solid to the touch with just enough padded surfaces to project a class-above ambience. Leather upholstery is standard on Limited and Ultimate trims. In the current fashion, a tablet-like infotainment touchscreen – 8-inch diameter on Ultimate models, 7-inches otherwise — sits atop the central instrument panel. The Electric shares the gas models’ gauge layout, though customized to show range, charge status, and other EV specifics. It also has its own center console with “drive, park, neutral, and reverse” buttons and an electric parking brake rather that the gas models’ conventional transmission shifter and levered parking brake. Exclusive to the gas Ultimate is a transparent plastic panel that powers up from the dashtop to provide a very basic heads-up instrument display. No, and that’s not a bad thing, given the energetic performance of the turbo and Electric models and the fun-to-drive character of every Kona. The 2020 SE and SEL gas models will return with a 2.0-liter four-cylinder with 147 horsepower and 132 pound-feet of torque. That’s on par for base engines in this class, and so is the serviceable but far from lively performance. These models will again come with a six-speed automatic transmission and at around 9 seconds 0-60 mph, provide adequate acceleration for everyday chores. Hyundai will again provide ’20 Konas with three driver-selectable modes: Normal, Eco to conserve gas (or electricity), and powertrain-sharpening Sport. The last makes an SE or SEL feel more responsive around town, but for a surprisingly lively experience, turn to the Limited or Ultimate. They’ll reprise a 1.6-liter turbocharged four with 175 horsepower and 195 pound-feet of torque, output that’s near the top of the segment. These overachievers zip to 60 in 6.6 seconds and in Sport mode especially, merge and pass with verve in town and on the open road. To enjoy all that, though, you’ll need to put up with some cranky shift action from their seven-speed dual-clutch automatic transmission. The Kona Electric is quicker still. Its electric motor spins out 201 horsepower and 290 pound-feet of torque (think of torque as the force that gets you moving, horsepower as the energy that keeps you moving). Uninterrupted buy transmission shifts, 0-60 takes just 6.1 seconds and reaction from midrange speeds is strident. So is regenerative braking – the system that captures and repurposes braking friction to recharge the lithium-ion polymer battery. Lift off throttle pedal and the Kona Electric slows predictably but precipitously, enabling you to control deceleration with minimal use of the brake pedal. It’s interactive, functional, and entertaining. More than competent handling should again be a 2020 Kona selling point in a segment not known for sporty road manners. Front-drive gas models use a torsion-beam rear suspension and feel nimble enough. AWD models and the Kona Electric have a more sophisticated independent rear suspension. They change direction with greater control and confidence and their path through bumpy turns is less disrupted. The AWD system’s ability to distribute power to the tires with the best traction helps dry-road grip and is a recommended advantage in snow. The 6.9 inches of ground clearance is good for a subcompact crossover but with no provision to lock in a torque split, off-roading is best limited to gravel paths. Kona’s notably rigid structure helps it take bumps with an all-of-a-piece solidity, but ride comfort does vary with tire size. The 18s fitted to Limited and Ultimate are least absorbent, but their main shortfall is a tendency to roar and rumble on all but very smooth pavement, intruding on what’s otherwise a relatively quiet cabin. With no changes to powertrains anticipated, EPA ratings for the 2020 Kona will repeat those of the 2019. That ought to keep the ’20 Kona among the most fuel-efficient crossovers in the competitive set. Expect SE and SEL models with their 2.0-liter four to again rate 27/33/30 mpg city/highway/combined with front-wheel drive and 25/30/27 set. Look for the turbocharged Limited and Ultimate to return at 28/32/30 mpg with front-drive and at 26/29/27 with AWD. The EPA rates the Kona Electric’s range at 258 miles, an outstanding figure and 20 miles more than, for example, the Chevy Bolt. Under the EPA’s calculations, the Kona Electric achieves the equivalent of 120 mpg (expressed as MPGe). As with any EV, maximum range is achieved under ideal conditions: mild ambient temperatures, prudent driving, consistent terrain, conservative use of accessories. Hyundai says recharge durations vary by charger type, from nine-and-a-half hours on a standard household outlet to as little as 54 minutes on a commercial-grade Level III quick charger. Additional features are unlikely; Kona already offers a fine array of standard and optional equipment. Hyundai might, however, shuffle the content of some packages for 2020. And we hope it’ll consider adding blind-spot and rear cross-traffic detection to the SE gas model. Otherwise, every 2020 Kona will again come with the aforementioned Hyundai SmartSense safety system. It’ll again include essentials such as autonomous emergency braking designed to automatically stop the crossover to avoid a frontal collision with another vehicle. Likely to remain exclusive to the gas-powered Ultimate model is a deluxe version in which autonomous braking recognizes pedestrians as well as other vehicles. Expect the gas Ultimate to also come with automatic highbeam headlights. Kona Electric models should again feature adaptive cruise control to maintain a set distance from traffic ahead and, on the Ultimate Electric, to work in stop-and-go driving. Trim levels in both the gas and electric lines should again closely mirror one another, with SEs including such features as automatic headlights and support for Android Auto and Apple CarPlay. To that, expect ’20 SEL models to again add hands-free locks with pushbutton ignition, heated front seats, heated side mirrors with integrated turn signals, satellite radio, rear privacy glass, roof side rails, a leather-wrapped steering wheel and shift knob, automatic up/down front windows, illuminated vanity mirrors, and a shallow storage bin beneath the rear cargo floor. The 2020 Kona Limited grade should again have all that, plus leather upholstery, automatic climate control, automatic dimming inside rearview mirror with Homelink and all the wheel, powertrain, and trim featured detailed earlier. Same for ’20 Ultimate models – head-up display, enhanced SmartSense, etc. – plus wireless phone charging, rain-sensing windshield wipers, and imbedded navigation that doesn’t require a cell signal to provide real-time GPS mapping. Note that AWD models replace a compact spare tire with an inflation kit. They’ll probably increase slightly but continue to track just shy of rivals with equivalent features and power. That should again make the 2020 Kona attractive as a value, even if you don’t believe it’s attractive as a design. 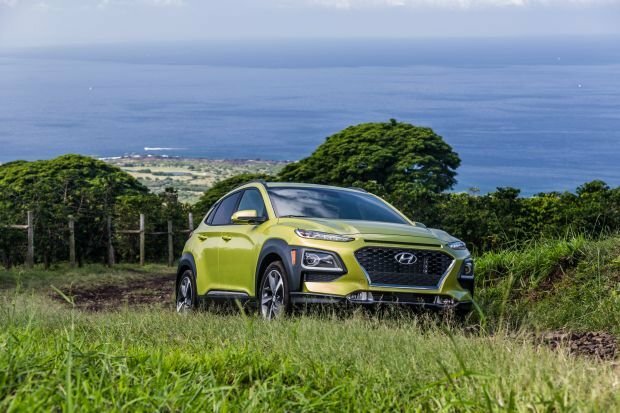 Estimated base prices here are for Konas with front-wheel drive and include Hyundai’s destination fee, which was $980 for 2019. To these base prices, expect to again add $1,400 to gas models for AWD and depending on trim level, $350 for the contrasting-color roof. Note as well that the only notable factory option is apt to remain a Tech Package for the SEL model (detailed below), so the only way to jack up base prices on the other trim levels is with dealer or port-installed options, such as cargo nets, mudguards, and the like. Among gas models, estimated base prices are $21,300 for the 2020 Kona SE and $23,100 for the SEL. Expect the SEL Tech Package to again include a power moonroof, power driver’s seat with power lumbar, foglamps, premium Infinity audio with subwoofer, and Blue Link Connected Car. It cost $1,600 for 2019. For the 2020 Kona Limited and Ultimate gas models, estimated base prices are $26,930 and $30,300, respectively. Hyundai began sales of the Kona Electric in California, with plans to roll it out in other states as time goes on. Estimated base prices for the 2020 Kona Electric are $36,500 for the SE, $42,400 for the Limited, and $45,700 for the Ultimate. Hyundai is quick to point out that those purchase prices can be reduced significantly because buyers of its electric vehicles should still be eligible for a $7,500 federal tax credit, as well as state-level credits of several thousand dollars in some cases. Expect a release date for the 2020 Hyundai Kona in the fourth quarter of 2019.